What is it with changing titles for home video release in the UK? There's been quite a bit of it in the past couple of years, usually genre films or cheapjack actioners that are being redressed in the hope that we won't pick up on the critical mauling they've been received elsewhere. But Kong Su-chang's 2004 R-Point has a bit of a reputation with horror fans and was the fourth highest-grossing horror film of all time on its release, so why change the title to Ghosts of War? 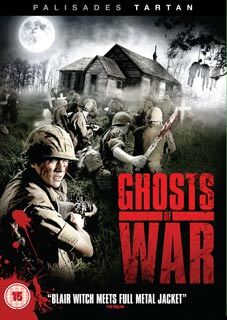 But then again, if you're targeting a wider horror audience, those who've never heard of R-Point or the Kong Su-chang, the reasoning must be that unlike R-Point, Ghosts of War gives the browsers a clue as to what the film is about. It is, after all, Kong's first melding of the horror and war movie genres, something he followed up in 2008 with GP506, which was retitled Guard Post for DVD release and was actually rather good.